This letter was written by Thomas Wright Goring (1838-1920) of Poughkeepsie, Dutchess County, New York. Thomas was born in November 1838, making him almost 23 years old when he enlisted in August 1861 at New Hamburg, New York as a Corporal. He was mustered into Co. I, Third New York Cavalry. He was promoted to Sergeant in August of 1862 and to 2nd Lieut. in Co. E when he re-enlisted in 1863. He finished the war in Co. H, 1st New York Mounted Rifles. Being sick, Goring was obliged to leave his company and was sent to Hammond Hospital, Beaufort, North Carolina, from which place this letter was written in July 1863. He recovered, returned to service and was mustered out on 11/29/65 at City Point. In January 1866, Goring was married to Sarah Elizabeth Whitehead (1847-1916) in Carrsville, Virginia. The couple lived for a time in Troy, New York but moved to Chicago, Illinois before the turn of the century. Goring was a tinsmith by profession, having learned the trade from Samuel Orchard of Poughkeepsie. Goring’s ancestry does not appear in on-line genealogy records but one source gives his place of nativity as Fishkill, New York. 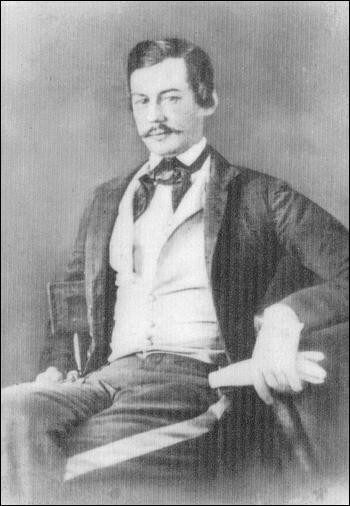 The only Goring family residing in Fishkill that seemed likely to be associated with Thomas was John Morris Goring (1806-18xx) and his wife Martha Heald (1805-18xx). They were natives of England, and emigration records indicate they came to New York in 1836. John’s father was named Thomas Goring (b. 1782) and he appears in the “Wright” family tree so I feel confident this is the same family. The 1870 Census records the occupation of John Morris Goring — Thomas’ father — as an engraver. Another son, John Goring, (b. 1852) is a tinsmith, like Thomas. Goring wrote this letter to his sister whom he does not address by name; I assume it was Victoria Goring (1842-18xx) who was still residing with her parents in Fishkill in the 1870 Census and as late as 1910 in Wappinger, New York, still unmarried. A couple of CDV’s of Thomas Wright Goring, his belt buckle, and a tintype of Thomas’s wife, Sarah Elizabeth Whitehead whom he married in 1866. Once more I take my pen in hand to address a few lines to you. I am at present in the Hospital at Bufort. Our company left little Washington on the 2nd of this month, arrived at New Bern on the 3rd. At 3 o’clock, got horses off, fed them, and at 5 o’clock they started to overtake our regiment that had started that morning on a raid. I, being sick, was sent to the hospital. The boys went about 90 miles in the enemy’s country, tore up railroads, burned bridges, burned one saber factory, also about 70 or 80 thousand dollars worth of provisions for the Reb Army. Took about 20 prisoners and got about $50,000 in Confederate money, all the tobacco they could carry, bringing in about 300 Contrabands and 150 horses without losing a man. They returned on the 6th. On the 7th the Capt. sent me word that I was detached from the company by order of our colonel. I am to go into our Howitzer Battery that belongs to the regiment there to be orderly sergeant. As soon as I get well, I resume my new duties. Think I will like it. About the 14th, our regiment of 12 companies with 2 companies of new cavalry [1st North Carolina Cavalry] & 2 companies of the 12th New York Cavalry went on another raid, making in all 18 companies of cavalry and 8 small howitzers. Each man [was] to carry on his horse three day’s rations for himself and 12 qts. of oats for his horse. Then each company had 2 mules carrying three day’s rations on their backs, making in all 6 day’s rations. No wagons accompanied the expedition. Everything was got up for quick movements. They captured Greenville on the Tar River, burned a railroad bridge there 300 yards long, burned 500 bales of cotton, captured Tarboro, tore up the track, [and] burned the depot. From there, [they] went to Rocky Mount ¹ [where they] captured a train of cars that were just starting with 2 car loads of ammunition and 30,000 lbs. of pork. [They] set the train on fire [and] captured from it about $75,000 in Confederate Money — one of the boys getting $2200 (twenty-two hundred dollars) of it. [Then they] burned the depot, tore up the track for a couple of miles. Altogether, they destroyed about Three Millions of property. They burned a cotton factory & a great many uniforms for the reb army. On their return they were cut off 5 different times by superior forces with artillery but managed to get around them all but the last ones. Them they had to cut their way through. They fought the day before they came into New Bern 9 hrs. Then the Rebs left. Our regiment lost 9 wounded. They came in with the rest of the boys, but the 12th were not so lucky owing to their being new men and not knowing the ropes. They were ordered to charge & did so, leaving about 20 men prisoners in the hands of the enemy — some of them wounded. They boys returned bringing in 600 horses and Mules and 800 Contrabands. They had 1000 but in the fight 200 of them straggled off and the Rebs got them. 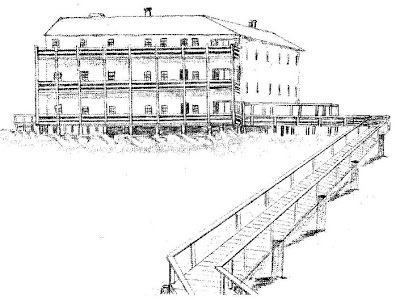 I stayed in the hospital at New Bern till the 14th & not getting any better, the surgeon sent me here to Bufort to get the benefit of the sea breeze. The hospital ² was formerly a large Hotel & Watering place, but the owner left here when the Yankees came around so his house was confiscated. There are every facility for sea bathing, bathing houses & a constant cool breeze all the time. Just opposite, across the Sound, about three miles from here is Fort Macon. I am going over there in a day or two as soon as I get a little stronger. Think I will go back to New Bern in about a week as I begin to feel pretty good. Am some weak yet. This is not much of a place, but there are right smart of girls live here. I went to church Sunday but there was not a very big turn out. There are any quantity of crabs here & in a few days I am going to try my hand at catching them. They are rather particular what we eat here. Have in the morning about half an hour before breakfast some medicine just as the doctor orders. For breakfast [we have] boiled milk, toast, one egg, some corn starch pudding. Dinner, bitters first, then toast, milk chicken soup & corn starch. Supper, bitters, milk, toast, corn starch & rice. So you see our diet is light & a person don’t get strength very fast on that diet. I received a letter from Lucy last night. She is well & I believe all the rest of them at home are the same. I am sorry they are having such a time at the North on account of the draft. I wish some of the old regiments here could be turned loose on them. They would make mince meat of them in no time. To think just when everything seems to be working for our good, then these Copperheads start a young war at home. I tell you, every soldier I have conversed with only wishes his regiment could get at them.³ They would not stand half the chance the Rebs do here. But enough of this. A tintype of Sarah Elizabeth (Whitehead) Goring (at right) and her two sisters.